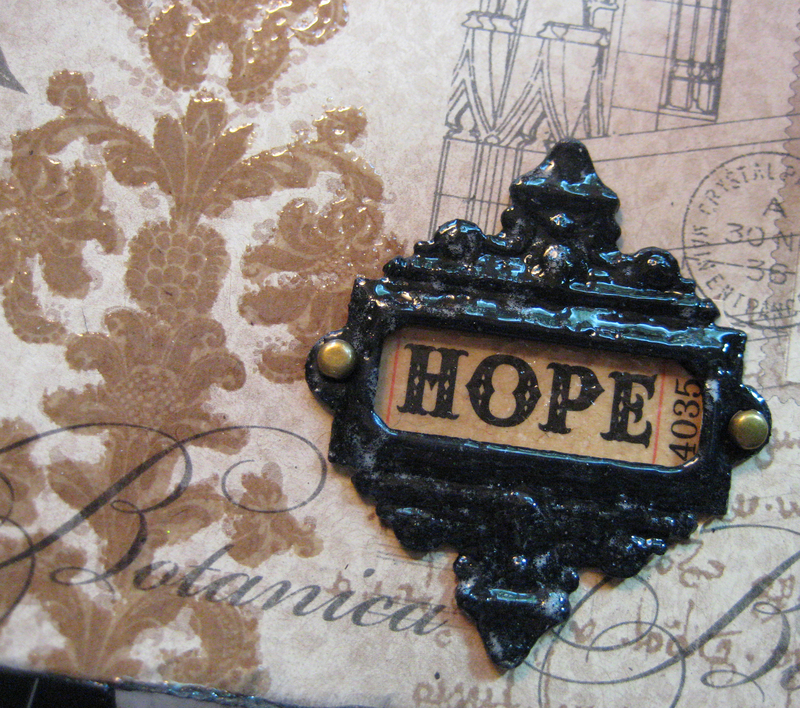 I was so excited when we got word about the Art Glitter, Want2Scrap, and Graphic 45 Blog Hop! 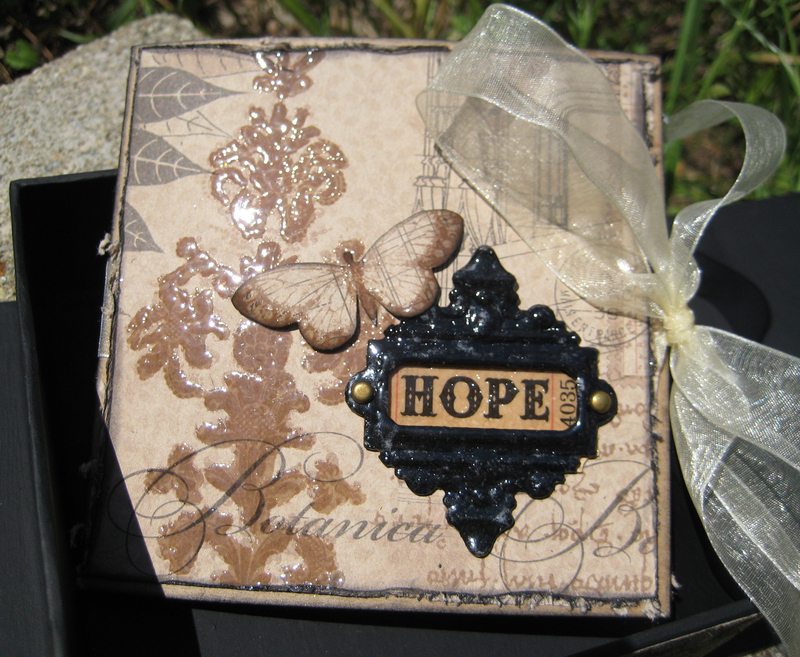 It took awhile to decide what project I was going to attempt but settled on using the cute little Graphic 45 Staples Kraftboard Altered Art Box. The box comes complete with an accordian-type book inside and a magnetic closure on the cover. At first I was going to cover it with Graphic 45 papers so I painted all the corners and edges with Pitch Black Adirondack Acrylic Paint Dabber. The more it dried, the more I liked the look so scratched the paper-covering idea and painted the entire box – inside and out! Love the elegant black finish! I made the three-layer medallion (Tim Holtz Paper Rosettes, Alterations by Sizzix) for the box center from Graphic 45 papers Forgotten City and Joyous Noel (I wanted a black base for the medallion and had this paper handy; it worked out well); Joyous Noel for the base, Forgotten City in the middle and the backside (Kraft-color) for the top. The outer edges and the upper creases are all inked with black ink, stacked and a large Want2Scrap gem added to the top center. 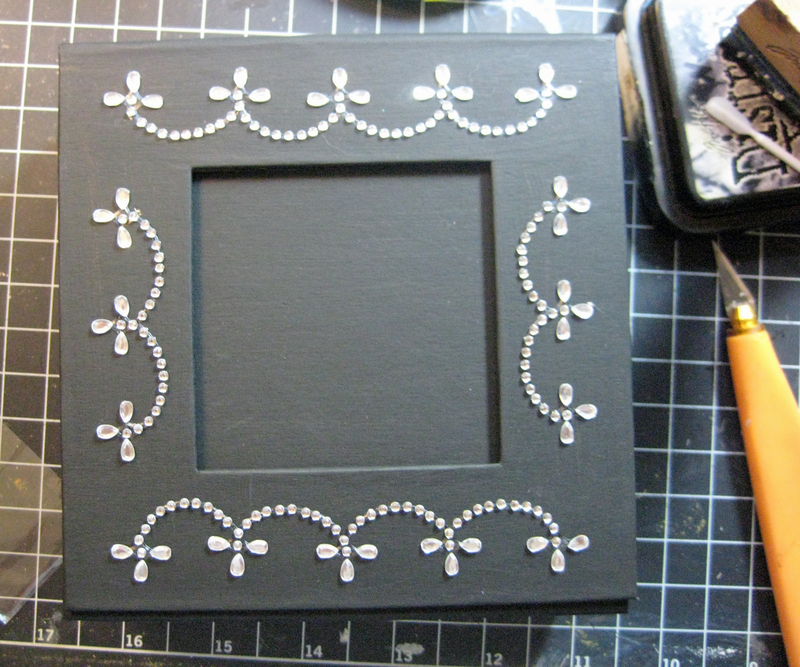 The beautiful sparkly gems on top are Want2Scrap, Beautiful Bling Borders by Nina Brackett – Fancy Waves. I was able to cut the two borders to fit the perimeter of the cover. Don’t they look pretty against that black finish? 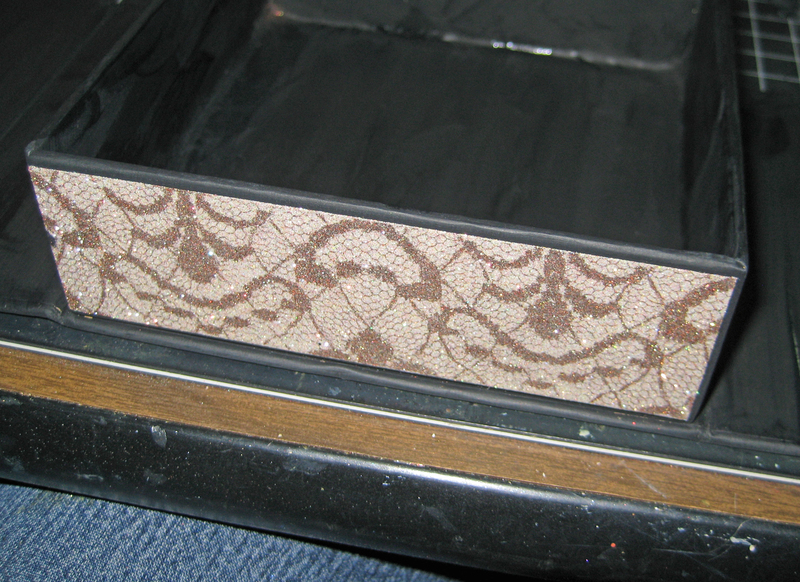 The side panels are double-sided sticky tape and Art Glitter Fawn No. 728 and Tree Bark No. 524, both microfine glitters, using the double-glitter technique with a strip of lace. These colors closely fit the color scheme and I just love the look of the faux lace. For the book I cut Forgotten City and Mechanical Mind to fit just inside the book’s pages. The edges were all distressed using Zutter’s Distrezz-it-all; inked them all with black ink and the edges of the book too. I tried a new technique on the papers that I watched ‘Blanche’ from La Blanche Stamps use at CHA last week. Using Ranger’s Perfect Medium Pen I colored some areas in and sprinkled with Ultra Thick Embossing Enamel (UTEE) then heat set. It really adds a lot of dimension and texture. 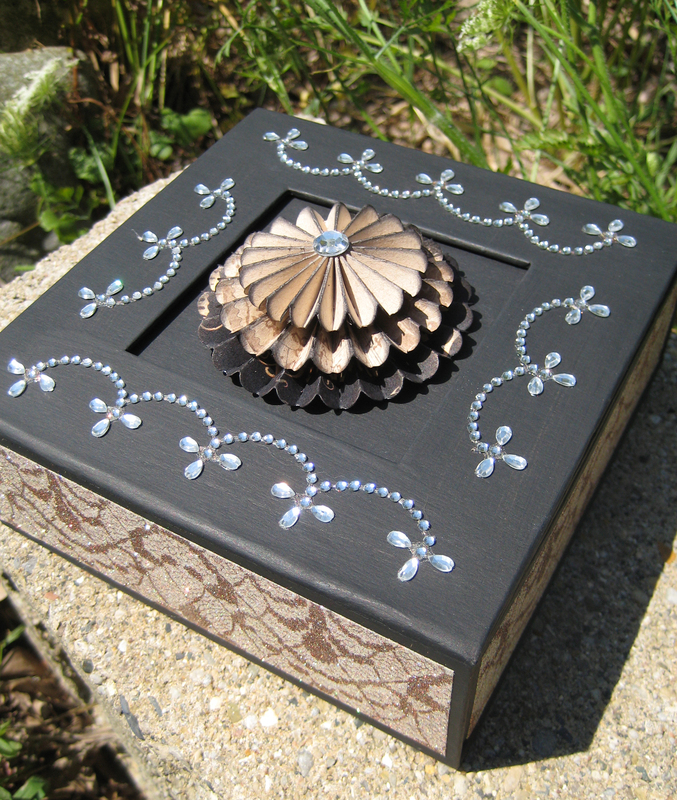 The Ornate Plate (Tim Holtz Idea-ology) is painted with Pitch Black Adirondack Acrylic Paint Dabber, then sprinkled with UTEE and heat set. I love the shiny look this achieves! A few of the elements on the papers were cut out, UTEE added and popped up for added effects. The ribbon is laid down prior to the papers being adhered to the book pages. 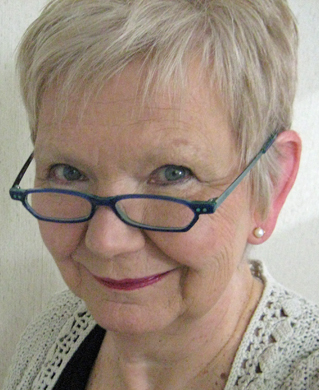 I was so pleased with the results of this project – especially going into the project without a clear vision! What do you think? Be sure to check the Art Glitter Blog every day this week for more project inspiration! We have Blog Candy to give away to 4 lucky commenters! 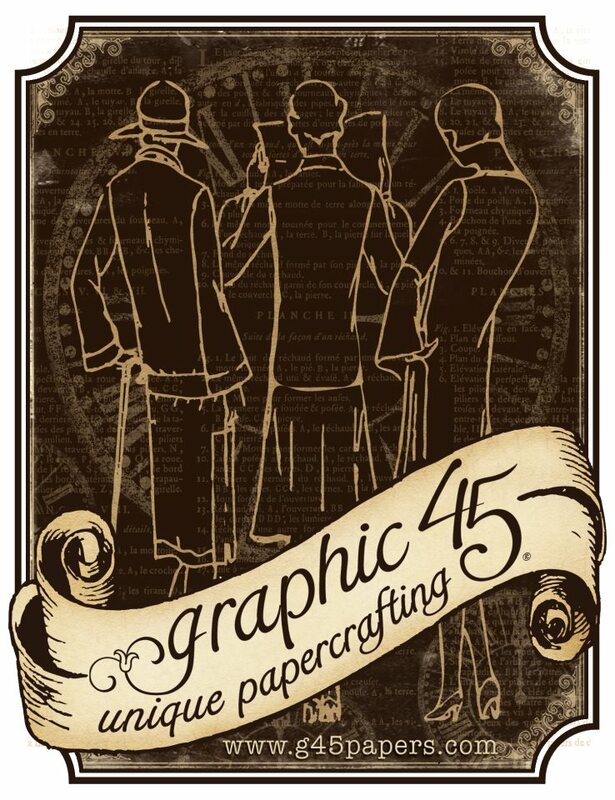 Visit us, as well as our friends over at Want2Scrap and Graphic 45, each day this week; prizes and lots of wonderful inspiration coming your way!Also, make sure you stop by the Want2Scrap Facebook Page and Graphic 45 Facebook page this week and tell them Art Glitter sent you! Check out my cohorts on the Art Glitter Design Team and see the wonderful projects they’ve created for this blog hop. They’ll be posting for Art Glitter this week! Be sure to leave them a comment as well as on Art Glitter’s Blog for your chance to win BLOG CANDY! Beautiful box! Love the lace technique! This is awesome Linda! What a beautiful project! I love all the elements you’ve brought together so perfectly!! Love this. I’m really partial to anything in a box! Love learning new techniques. Thank you so much. Thank you Diana. Aren’t boxes fun! Linda, the box is absolutely beautiful. Can you let me know how you did that lace look on the sides? I sure do miss Scrap Tales and your classes. Thank you Cindy! Great to hear from you. This is a class offering for Fall so watch my calendar here on the blog for dates and times. 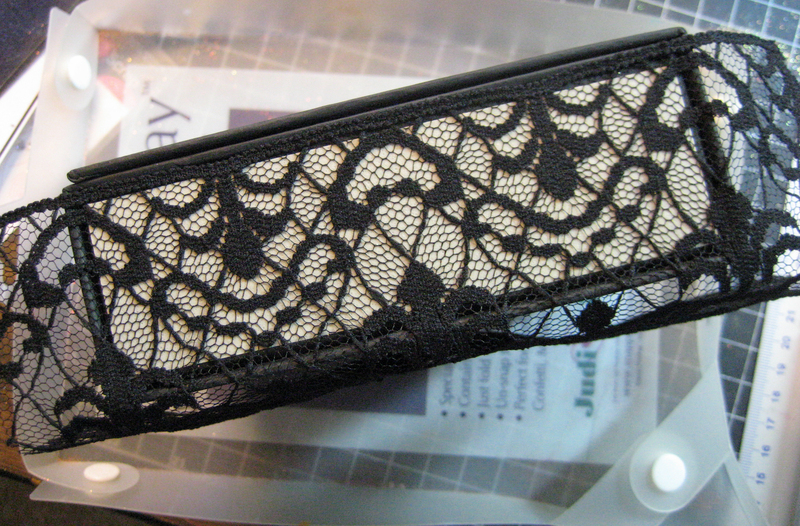 You can see the technique for faux lace here.